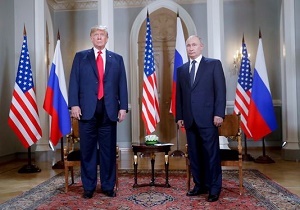 WASHINGTON – Russian President Vladimir Putin won't be coming to Washington for a second summit with President Donald Trump anytime soon, a Putin spokesman said Monday. "Now it is out of (the) question," Dmitry Peskov, Putin's spokesman, told Russia's state's news agency Tass. He said it's unclear when the two world leaders could meet next, adding that the current diplomatic standoff had created an "untenable pause" in U.S.-Russia relations. Last week, Trump canceled a high-stakes meeting with Putin that had been scheduled to take place when both men were in Argentina to attend the G-20 summit of world leaders. Trump said he nixed that tête-à-tête because of Russia's seizure of three Ukrainian vessels and crewmembers. But Trump's decision came just hours after his former personal lawyer, Michael Cohen, admitted lying to Congress about a proposed Trump Tower development in Moscow during the 2016 presidential campaign. Cohen's admission was part of a plea agreement with special counsel Robert Mueller, who is probing Russia's efforts to tilt that election in Trump's favor. A White House spokesman did not immediately respond to a request for comment on Peskov's remarks. The White House invited Putin to meet with Trump in Washington last summer, after their controversial summit in Helsinki. Trump earned widespread condemnation after that closed-door meeting because he seemed to defer to Putin and to downplay U.S. intelligence conclusions that Russia interfered with the U.S. election. The chorus of criticism grew even louder after the White House issued its invitation to Putin to come to Washington. But no one is talking about that possibility now "because now general prospects for their next meeting are unclear," Peskov said. He said Putin and Trump would probably not have another opportunity to meet again until the next international summit, in six months in Japan. "It is an untenable pause both for our bilateral relations and for international security and stability," the Russian spokesman said.